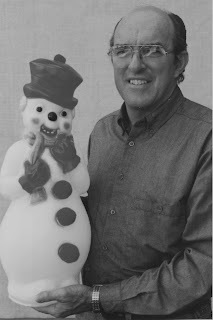 This page features some of the Maher Ventriloquist Studios retired products that were designed and built by Kevin Detweiler. 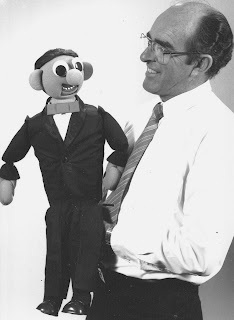 Kevin built his first ventriloquist figure as a pre-teen (above) while working in his Dad's shop, Maher Ventriloquist Studios. Today, he is owner of his own shop and business, Animated Puppets. 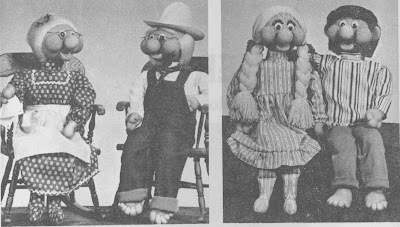 Mimi, PaPa, Patty, and Pete - the "Puffets" were the winsome creations of Kevin and Sonja Detweiler. Handcrafted. 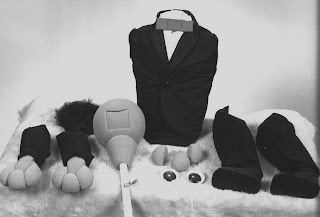 Both beginners and pros enjoyed the unique appearance of these ventriloquist figures made with the traditional hollow body, head post style of operation. Introduced in 1882 and produced for only a short time. When the Detweiler's sold their Illinois home and went on the road full time with their family ministry in 1982, they no longer had their shop to work from so the Puffets were discontinued soon after. If you have a Puffet in your family of puppets, you have a very rare character! This clever puppet was designed as a teaching visual. 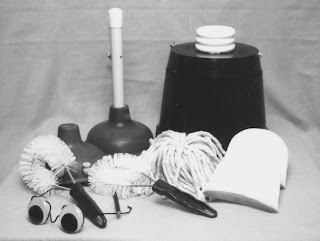 Made up entirely of cleaning closet items (pail, sponges, brushes, mop, and plungers), the performer would assemble the character, touting real-life human character applications about each piece as "Scrubby" was assembled during the act. When the plunger head was added as the hilarious surprising finish, ventriloquist and puppet would finish in dialogue conversation! These were made up in a limited number. I have not been able to document the year although I believe it was during the decade of the '90s. Oh, this was fun! A ventriloquist figure with parts that attached with Velcro so it could be assembled, or taken apart, as part of the act - in full view of the audience during the show! 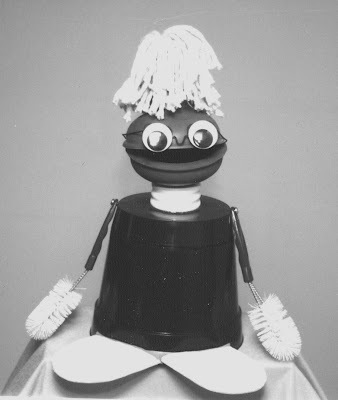 Demand was good for the take-apart puppet, but due to the labor intensive nature of this unique puppet's production, it was discontinued after just a few months. There's no question - this was the most popular novelty puppet created by Kevin Detweiler. The open and closing mouth was controlled by a string on back side of the tie. Dozens of the original design (pictured here) were sold. Then a licensing agreement was made with Lovik World to handcrafted a revised version of the ties in quantity for distribution through dealers. Hundreds were sold. 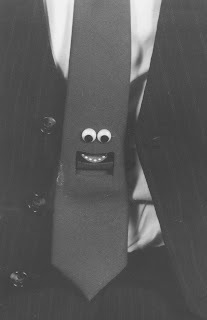 The comical "Talking Tie" was popular with both vents and non-vents. 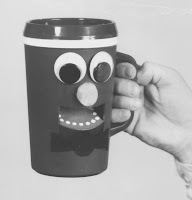 One of the more popular novelty puppets sold by Maher Studios. Always a hit! 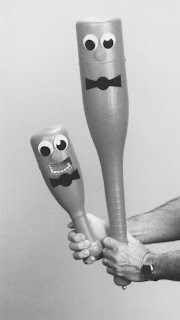 Discontinued only because of unavailability of the toy bat itself into which the moving mouth was installed. "Take a sip and give me no lip." The mouth control for this handy puppet was on the handle which made it very easy to pick up and use. For those who "thirst for laughter, this is a thirst quencher", or so the ad read when it was offered in 1990. 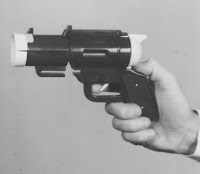 "Hot Shot, the Talking Gun" was introduced at the 1990 Ventriloquist convention. You've heard of "Smith and Wesson" - this was "Chip & Dale" (so dubbed as I recall, by our good friend, Dale Brown). 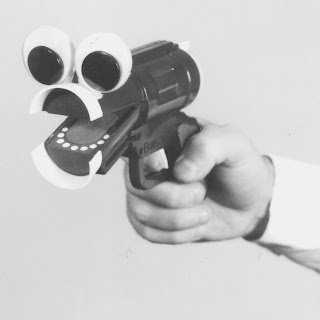 The eyes, fastened with velcro, were stored inside the body of the gun when not in use. A pull on the trigger opened the mouth. When our photographer took these pictures, he said, "Now I've seen everything!" "Don't bet on it, Doug!" was my reply. Make no bones about it, this full size 3-D Skeleton vent figure was both fun and useful. When first produced, it was thought of in a seasonal manner, but it soon proved to be a year-round puppet, because several performers creatively used the mesmerizing character to convey messages on the subjects of safely, health, and drug education. He even had light up eyes! What a scream! 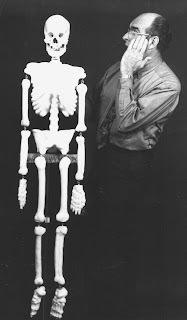 The skeleton puppet concept began with a few early models that were fitted with a flat 2-D body without legs (below left), but it was the full "body" five foot character with 3-D body that became the model of choice. 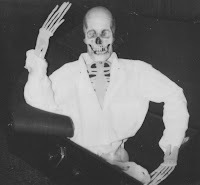 The book 'Dem Funny Bones' (still available from the Maher Bookstore was published as a result of this puppet.